Anderson's departure is a blow to a company that has already lost two key executives, just as it appears that AMD has regained its footing. 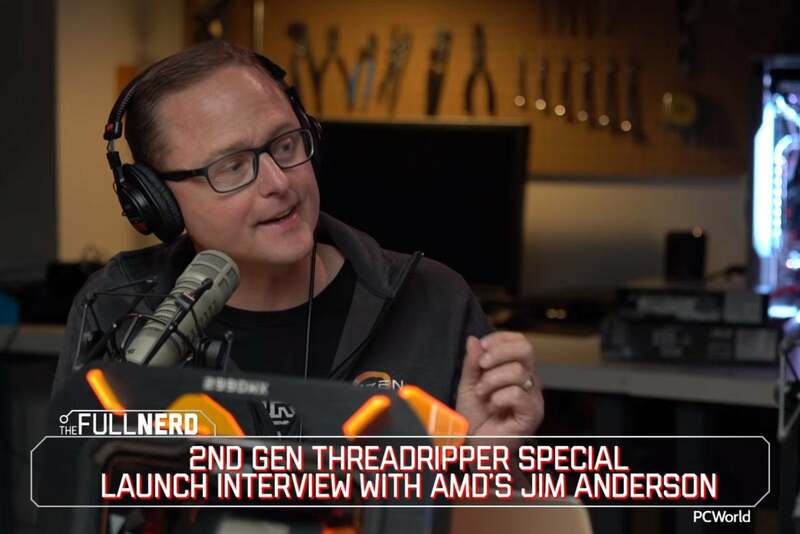 As AMD moves into the next phases of its Threadripper and Vega chip architectures, it has made two key business changes as well: Jim Anderson, who oversaw AMD’s Computing and Graphics Group, has left the company. In addition, AMD has shifted its leading-edge manufacturing to TSMC, and away from GlobalFoundries. Anderson, who appeared on PCWorld’s The Full Nerd podcast just two weeks ago to explain the ins and outs of AMD’s new 2nd Gen Threadripper chip, has left to become chief executive of Lattice Semiconductor, an FPGA maker. Anderson will be paid several million dollars in stock and incentives, according to a Lattice statement. An AMD spokesman said that it was always Anderson's career ambition to eventually become a chief executive. Saeid Moshkelani has been named in Anderson’s stead as senior vice president and general manager of the Client Compute Group, overseeing AMD’s CPUs and integrated APUs. Moshkelani was responsible for the semi-custom APU wins into the Microsoft Xbox and Sony Playstation, AMD said. Both of those design wins were critical for keeping AMD afloat while it developed its current Ryzen chips. AMD is in the middle of transitioning into an evolutionary phase of its product roadmap. The 2nd-generation Threadripper chip ramped up its core count by connecting multiple chips together, rather than starting fresh with a new architecture. Likewise, AMD has said that it will migrate its Radeon “Vega” graphics architecture to a new 7 nm process. Though there’s never a good time for a key executive to leave, Anderson wasn’t responsible for overseeing the rollout of a new architecture—though he undoubtedly was working on the future versions of the Zen architecture that AMD disclosed last year. Nevertheless, it’s the latest departure of a key AMD executive, following the exit of graphics executive Raja Koduri to Intel late in 2017, as well as the earlier departure of AMD’s Zen processor architect, Jim Keller, to Intel, too. (Keller had a stint at Tesla in the interim.) Radeon chip marketer Chris Hook also left AMD for Intel. As a chip architect, Keller’s role was probably the most significant loss for AMD. However, Anderson obviously played a key role in managing customer relationships and being the public face of AMD’s Ryzen and Threadripper chips. What this means to you: Anderson's departure adds some uncertainty to AMD’s future, after a year or two in which the company was firing on all cylinders. From a business perspective, AMD’s executives have two key roles: designing leading-edge chips, and then selling them. AMD has lost executives in both key areas. In a blog post, AMD’s chief technical officer Mark Papermaster reassured customers that there will be no change to the company’s product roadmap. AMD has already taped out multiple 7nm products at TSMC, including the 7nm Vega chip scheduled to ship in 2018, and the first 7nm Epyc server chip, planned to be released in 2019. Both the Zen 2 architecture as well as the next-gen Navi GPU are also scheduled to be manufactured on TSMC’s 7nm fab lines, he added. According to Pat Moorhead, principal at Moor Insights, AMD's existing 7nm designs were already on the TSMC process. "I don't think AMD had any relevant 7nm designs at [GlobalFoundries]," he tweeted. GloblaFoundries announced that the company is shifting away from leading-edge foundry production, apparently yielding to TSMC, Samsung, and other chip foundries willing to aggressively invest in leading-edge manufacturing lines. Instead, AMD will keep its existing and older Ryzen, Radeon, and Epyc lines on the 14nm and 12nm lines that GlobalFoundries is expected to maintain, AMD said. GlobalFoundries said in a statement that it is putting its 7nm FinFET lines on hold, shifting development resources to make its 14nm/12nm lines more relevant to its clients. Chief executive Tom Caulfield painted the company's shift in strategy as a reaction to the slowing pace of Moore's Law, an axiom which has governed the pace of semiconductor manufacturing improvements for decades. "Essentially, these nodes are transitioning to design platforms serving multiple waves of applications, giving each node greater longevity," Caulfield said in a statement. "This industry dynamic has resulted in fewer fabless clients designing into the outer limits of Moore’s Law." This story was updated at 1:33 PM with additional details on Lattice Semi and GlobalFoundries, and a comment from Pat Moorhead, and at 2:33 PM to add clarity to the executive departures.